Congratulations on 2013 Super Service Award! This is the 5th year in a row that All Furniture Services is a winner of Super Service Award, for continues outstanding work and customer relation. Super Service Award, a leading national honor, recognizing excellence among service providers who maintain a superior service record. 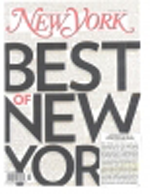 Less than 5% of thousands of businesses earn this prestigious award each year, so congratulations! 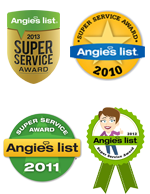 The Super Service Award is given to companies that have achieved and maintained a superior service record on Angie’s List. Eligibility requirements include maintaining an “A” rating overall, receive a minimum number of reports, be in good standing with the BBB, and not have been in the “Penalty Box” for failure to respond to an Angie’s List member’s complaint. AFS Completely restoring and refinishing almost all the furniture in the Ameristar’s Cactus Petes Hotel & Casino, as well as installing tinted glass tops. All Furniture Services providing service in repair and restoration of furniture for all rooms at Venetian Hotel and Casino in Las Vegas. Hospitality Furniture Collection, one of the leading companies worldwide in furnishing hotels and large commercial and residential complexes started working with All Furniture Services for repairs, restorations and custom work nationwide. Moveourstuff.com opened account with AFS and requested All Furniture Services to subcontract them in all furniture disassembly assembly repair and restoration projects. You loved it when you bought it in the first place. A great repair shop can make you love it again. They’ll send a workman to your home to restore your beat-up chest of drawers for $145 to $275 and they’ll try to do it with nontoxic chemicals so you don’t have to air it out afterward. Price to buy new: An Acacia Low Dresser is $399 at CB2. 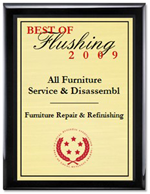 I am pleased to announce that All Furniture Service & Disassembly has been selected for the 2008 Best of Flushing Award in the Furniture Repair & Refinishing category by the U.S. Local Business Association (USLBA). 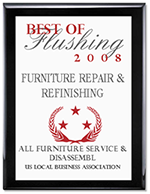 WASHINGTON D.C., October 6, 2008 — All Furniture Service & Disassembly has been selected for the 2008 Best of Flushing Award in the Furniture Repair & Refinishing category by the U.S. Local Business Association (USLBA). Rica Transport Referred All Furniture Services to Service Israels Designs and Living and their Customers. Rica Transport Referred All Furniture Services to Service Israels Designs and Living and their Customers. All Furniture Services Proudly started servicing them. 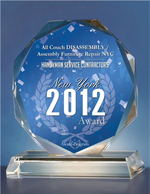 All Furniture Services LLC proudly started servicing Hickory Chair and their customers in East Coast. Environment Furniture Requested All furniture Services to cooperate in servicing them and their customers. Extell Development Company subcontracted All Furniture Services LLC in NYC development detail finishing services. All furniture Services was subcontracted by Extell Development Company in NYC High Rise Development Detail finishing project. Ergomotion Requested All Furniture Services to service their customers in East Coast. All Furniture Services was choosen to service customers of Ergomotion in East Coast.